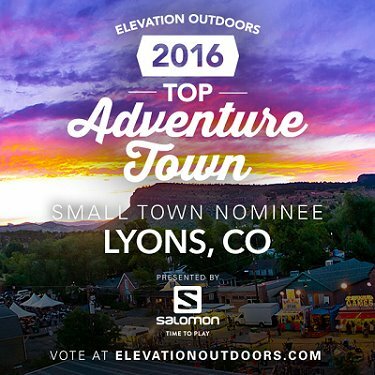 Thanks for all the votes - Lyons has made it to the second round of Elevation Outdoors Magazine’s Top Adventure Town poll! Winners of the contest will be featured in the November print issue of Elevation Outdoors Magazine, and offered a substantial discount to advertise in the November or December issues. Please continue to show your support in showcasing Lyons as the Top Small Adventure Town! This round will run through August 29 at 9 a.m.
Each person can vote once per day! 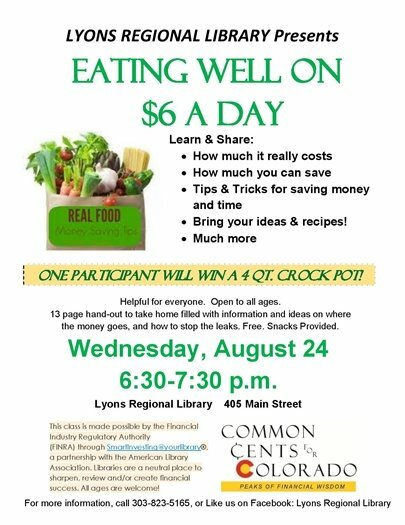 Lyons Prepared is a group of volunteer citizens, who work to coordinate emergency preparation and communication, to residents and visitors within the Lyons Fire Protection District. The mission of Lyons Prepared is to support neighborhood emergency preparedness; strengthen our ability to communicate well during an emergency; and enhance relationships between our fire district and surrounding communities and Boulder and Larimer County emergency planners. The team has established plans and information relevant to the Lyons area, which includes resources, proposed neighborhoods, preparedness guidance, and meeting dates, available online. A quick reference can be found on the Town 's website, or at lyonsprepared.com. 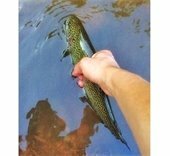 The 2016 Colorado Parks & Wildlife fishing regulations now include Lyons for Catch & Release - North & South Saint Vrain Creek. 2. Trout must be returned to water immediately. To report poaching, call 1-877-265-6648 or email game.thief@state.co.us. The Lyons Arts & Humanities Commission, Sounds of Lyons, and Boulder County Arts Alliance seek volunteers for the 2016 Arts on the River production. Set at beautiful River Bend, Arts on the River combines music, art, and nature into one sensational event. Artists of all mediums will be selling their work at the event, while musicians perform live music. Drink and food from vendors such as Oskar Blues, Button Rock Bakery, and Spirit Hound Distillers will be on site. Please help support local business, and consider volunteering for this event! On August 27, Venus de Miles - Colorado's largest all-women's road ride - will take place in Boulder County. The bike event covers more than 100 miles, including routes through Lyons. This is a friendly reminder to plan accordingly for the large cycling event through Town, and to please be cautious while sharing the road in a vehicle. Make Sure You are Election Ready! Many changes have been made in Colorado since the last presidential election. The Boulder County Clerk and Recorder’s office wants to make sure everyone is ready for November. All active voters in Colorado now receive a mail ballot. Check your voter registration and make sure it is current at www.BoulderCountyVotes.org, especially if you moved in the last year or haven’t voted for a few years. All active registered voters will be mailed a ballot to the address provided on their voter registration beginning the week of October 17. Sign up for Ballot Track. Visit www.BoulderCountyVotes.org now to sign up for Ballot Track to receive messages by email, text, or phone when your mail ballot has been printed, mailed, and received back by Boulder County Elections during election periods. In person voting is available. There are no more “traditional” polling locations but if you prefer or want to vote in person, a list of Voter Service and Polling Center locations will be included in your mail ballot packet. These Voter Service Centers open as early as October 24 and voters can choose to visit any Voter Service Center to vote, not just the location closest to their residence. For more voter and election information, visit www.BoulderCountyVotes.org or call 303.413.7740.